Bangladeshi students block a road during a protest in Dhaka on March 20, 2019, following the death of a student in a road accident on March 19. 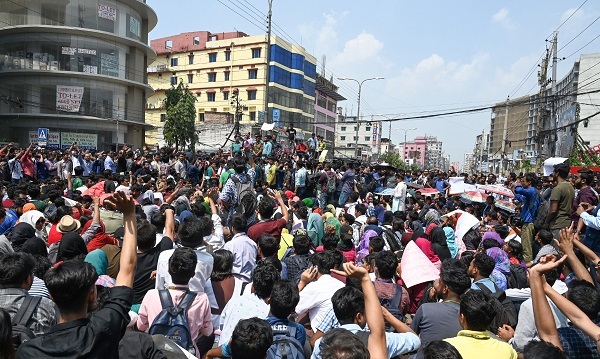 Hundreds of students demonstrated in Dhaka after a teenager was struck and killed by a speeding bus, just months after a similar tragedy sparked Bangladesh's biggest anti-government protests in decades (Photo: MUNIR UZ ZAMAN/AFP/Getty Images). 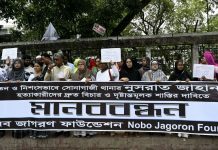 Hundreds of students demonstrated in Dhaka on Wednesday (20) after a teenager was struck and killed by a speeding bus, just months after a similar accident sparked Bangladesh’s biggest anti-government protests in decades.